Oppo announced Realme 2 last Tuesday with an extremely affordable price tag and fancy looking body. Four days ahead of the event we already knew the phone is going to be a Flipkart Exclusive, and now the time has come for its actual market launch. Tomorrow at noon the Realme 2 will be available for purchase in Diamond Red and Diamond Black at the online retailer. Announced with a Snapdragon 450 chipset, the Oppo Realme 2 is aiming to disrupt the affordable market. It comes with 3/32 GB or 4/64 GB memory combo and a basic 13 MP + 2 MP main camera setup. The selfie snapper is 8 MP and the phone packs a massive 4,230 mAh power cell. The price of Oppo Realme 2 is INR8,990 (€110/$130) or INR10,990 (€130/$155), depending on the version selected. There are also some offers from HDFC Bank, the carrier Jio, and Flipkart gives back up to INR500 back if you return your old phone. 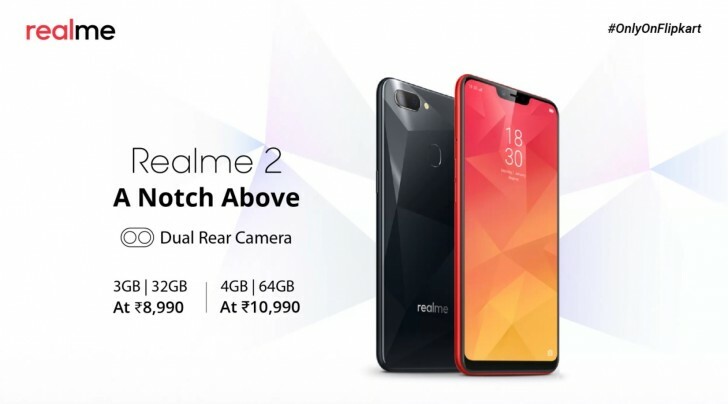 When realme 2 (6' 128) will be available?